This ain't no build thread! Thread: This ain't no build thread! After some careful consideration, I figured WTH. Those of you with short attention spans or who are easily bored will want to skip this first post, as I'm going to give some of my background. You may want to skip the whole thing altogether! I came about my gearhead status a little later than some do. Not quite sure what caused it. I did help my dad work on cars when I was younger, but that was mostly of the routine maintenance variety of repair. While I was in college I became more interested in motorcycles, I was never allowed to have my own but could ride my grandfather's on the back country roads (without a license no less) when I visited them. 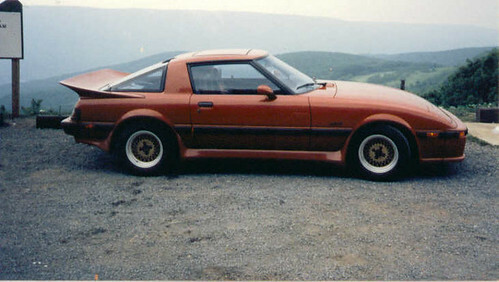 Then my senior year, Mazda came out with the RX-7. I was familiar with the rotary since my sister had owned an RX-2 (which she used to race and generally humble much bigger cars with), but the styling of the 7 was wow! As it worked out, I was able to buy one the following year, which I still have. That started my journey to where I am today. I am definitely a Mazda fan. Probably get that in part from my dad, although he was a Buick fan (no accounting for taste). Over the years I have had quite a few, both performance and pedestrian models (Millenia S, 2nd/3rd gen Protege, 1st/2nd gen MPV, etc) but never seemed to be able to get into a Miata. One of my brothers had two, a '94 (IIRC) and a '02 SE in titanium. I drove both and they had what I liked about all Mazdas in general, my RX-7 in particular, and had the cherry on top of being a convertible. Two years ago I was driving home from Cars & Coffee with my wife when we saw a Miata. After admiring it, she told me if I sold the Protege I could get one. I know she didn't think I would ever sell that car but she underestimated my desire. I immediately began plotting, worked out a deal with my oldest son for the Protege and then began looking for the Miata. I knew I wanted something in the maroon color range, when I first saw a 2000 SE (Mahogany Mica for those who live under a rock) I knew that was the one. 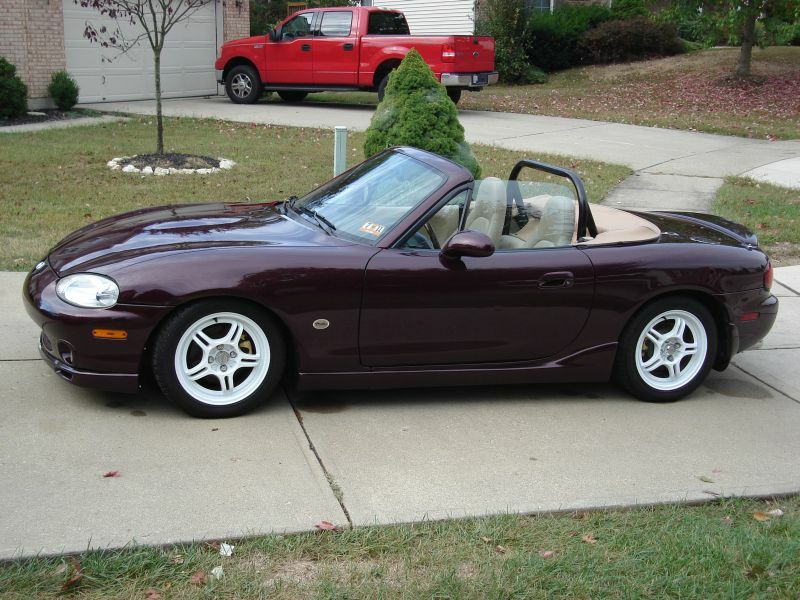 After chasing a couple of cars (both found on eBay, one was in northern Ohio and the underside looked way too rusty, the other in Florida and was way overpriced), I happened upon the $9.95 Miata for sale (Miatamart) site. There was a very nice 2000 SE with low miles and a JRSC under the hood. I immediately got in contact the seller. He had just listed the car a day or so before. Did some back and forth with pictures and such, I told him I'd like to look at it and then I got the loan. On 18 September 2010 the wife and I drove three hours to West-by-god-Virginia, crawled around the car, took a test drive and then bought it. Drove the three hours home in the evening dark, top down the whole way, hatless and without ear plugs (left them in the other car), grinning like an idiot. When we were almost home we stopped to get something to eat and my wife started laughing at me because my hair was sticking straight up. I didn't care, I had too much fun. It appears that I can't post a picture via this site, so I'll have to break down and get some sort of account on one of those new-fangled picture hosting sites. I just heard a lot of thuds from people who know me from elsewhere hitting the deck after reading that! Last edited by chiefmg; 10-07-2012 at 11:28 AM. Edit: I probably ruined the post layout of your story. Sorry. Lexy (Little Hobo) - Transforming from Wreck to Race Car. Your priorities seem a bit messed up to me, although that's because I try to get my lap times to decrease. In any event, I don't regard what I do as a build. Call me old-fashioned, but to me building a car involves tearing it apart and putting it back together. I will be doing that to my RX-7, but not to this car. What I have done so far, and will continue doing, is to make modifications and improvements to bring it to where I can say it's mine. If I can provide a gem or two of knowledge to someone along the way, all the better. I have done a lot in the past two years and will slowly document all that (pretty much literally as at present I am at work on a merchant ship and our Internet connection is via satellite, which is s-l-o-w). I tend to be more of the get the job done type than the take a picture every stage of the way to preserve it for others type. You'll have to deal with it, I'm not changing because you aren't cute enough. No worries, as you can read in post 4 it is due to my slow connection. Better to have some breaks for people as otherwise they will get tired of reading mine. Ok, time for a little bit about the car when I brought it home. The guy I bought it from had picked it up from some sort of wholesaler in FL. Not sure how many owners there were in between, but he somehow managed to track down the original owner. He had bought the car new and after having it a year had the JRSC installed (possible most or all of the other mods, I'm a little hazy on that). As a result of the previous owner's interest he had all the papers that the original owner had held onto, which was nice. Unfortunately I guess he didn't have the SE extras, more on that down the road. As mentioned the car had the JRSC (Jackson Racing Supercharger) which was the M45 Eaton. The rest of the supercharger install included a DDM Works cold air intake box, JR timing controller, Walbro 255lph fuel pump with restrictor pill, and finally the piece de resistance, a small black box (I can't remember the correct name right now) which basically fooled the ECU into thinking the air temp was cooler than it was so that extra fuel was added. So yeah, the resistor trick that you can buy on eBay. But hey, it worked just fine. The only other engine-related upgrade was a Brainstorm cat-back dual exhaust. For dress-up there was a stainless panel (sort of an air blocker) bolted on top of the front bumper attachment point, the 'charger outlet manifold was polished, there were a ton of stickers on the radiator frame and cross-over tube, and a very noticeable set of yellow silicone hoses EVERYWHERE (just ask Bryan, I think he saw it). Suspension was a set of Bilstein PSS coilovers with 15 X 6.5 Alpha wheels wearing General Exclaim UHP tires (they were actually pretty decent). A set of matched JR sways front/rear (adjustable tubular front), braided stainless steel brake lines with some drilled/slotted rotors and unknown pads (calipers were painted yellow) finished that off. Interior was stock except for a Hard Dog Ace rollbar, an auto-dimming rearview mirror, a nice cloth boot cover, and a trunk lid storage holder inside the trunk. As you will be able to see once I get a picture posted, the car was way too low. On certain bumps I would hear a scraping noise, thought it was the tire hitting the fender liner (it was) but mainly it was the right "frame rail" hitting the ground. That wasn't acceptable to me. Last edited by chiefmg; 10-05-2012 at 01:05 PM. I want to see this Miata and the RX7 after reading all this!!! Who are you sir? I don't recall you knowing me from elsewhere, so if you think your pretending to fall over gets you past my sensors, think again! Or are you a secret stalker (I am joking, I said elsewhere I don't use emoticons [normally] which does make it a little difficult)? My main concern with posting pictures, especially on a free site, is what unscrupulous people might do. I'm not a conspiracy type but I do have boundaries. I'm willing to give it a shot, after all I have now moved into the 21st century according to my wife after getting a smart phone my last time home (little does she know how I use it). That said, right now I am on an abysmally slow connection and even small amounts of data take time. Nighttime is worse due to everyone else being on line. Daytime, well I'm not an IT guy who can sit around surfing all day long. I'll see what I can come up with though. You can try searching my screen name as I'm the same everywhere. Sort of insidious, if you will. Who am I sir? I'm nobody special, I just love Miatas and try to be friendly to all Miata owners, as I'm very much into the local Miata clubs, ive been into Miatas since my first Miata I got back in 1994. Anyhow, If you have a smart phone you can download the Flickr app for free and take photos with your camera/phone and upload right from your phone. What kinda boat are you on? Are you an E-7 or something? Would explain the screen name. Former squid myself. lol, Chief is good people! Looks like I got off on the wrong foot. Randy, I know who you are and have the utmost respect. My comment was directed at the fact you mimed hitting the deck based upon what I had said. The couple of places I have been on for years know that I don't post pictures, those guys usually give me a hard time so I was preempting their comments. I meant it in good fun, and I apologize if you took it otherwise. Tony, put down the big stirring paddle and set aside your popcorn. I will do this just for you though...I'm on a SHIP!!! Carry on. And thanks for making me blush. My screen name refers to my license and current position as Chief Engineer. Just to confuse you even further, I was in the USNR for a long time. Left as an O-6. I think you should be able to see it, if not then I'll be sure to load it wherever I end up getting an account. The RX-7 will have to wait. 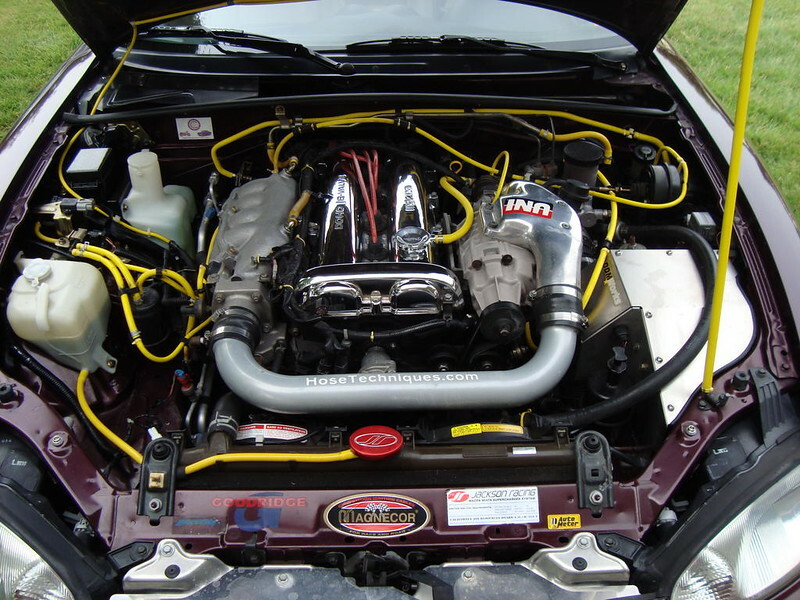 On the plus side I did find an underhood picture of the Miata the PO sent me, I will warn you before posting it as you will want to have sunglasses handy. I apparently deleted it from my computer, you will all understand when you see it. And yes, it's still a boat to me Tony, LOL. I was on a warship, and we still call them boats too, LOL you can call them like you see them, your Submariner brother is right, sitting duck. So you are the CHENG then eh, nice? I was a Snipe back in the day, worked on Gas Turbine engines in the USNavy (they use them for main propulsion) However I was an "Enlisted" grease monkey, spending most of my time below decks in the main engineering rooms. Anyhow. please do carry on with the thread!! that Miata looks great!! such a nice color too!! Thank you kindly sir. Yes, I am a snipe and damn proud of it! Last edited by chiefmg; 10-08-2012 at 07:32 AM. In the Navy, my boat was a Humvee. Phat, Chief's name threw me off too on a couple other sites. I figured he was a E6 goat with a cup of coffee in his hand, a GM who made Chief but we were thinking in Navy terms. Chief, I know you're not new and we've talked for a long time but great to have you here. I know sometimes you're dealing with slow satellite Internet on your boat, err ship but thanks for sticking with us. Don't worry too much about uploading your pictures to Flickr or Photobucket. Nobody is going to clean out your bank account if you have a bunch of Miata pictures stored online. To make things faster, I reduce my photo sizes before uploading them. That technique would serve you well, especially when you're at sea with a slow connection. Last edited by Agent☣Orange; 10-07-2012 at 08:59 AM. Anyone else notice it's mostly the old guys posting in here? I've been here for a while but doing my usual woodwork imitation unless I had something to contribute. Not really sure why I decided to make this thread (okay you got me, it was so I can apply for MotM!) but we'll see how it goes. Last edited by chiefmg; 10-08-2012 at 07:31 AM.